Is it possible for anyone not to fall in love with this series? Have you met anyone who has dropped this series after the second book? No, me either. I am not one of those. I must know what happens. *Take note that if you have not read the previous two books, it will be spoiled for the reader. It's springtime at St. Vladimir's Academy, and Rose Hathaway is this close to graduation. Since making her first Strigoi kills, Rose hasn't been feeling quite right. She's having dark thoughts, behaving erratically, and worst of all... might be seeing ghosts. 1. Counseling and professional help is good for the soul. This book deals with certain characters going to professional counseling. At first, I was very cautious in how Mead approached this topic. It could either be very good, or very, very bad. Fortunately, I thought she executed this well. The counselor was presented in a positive manner and allowed the characters to come to their own conclusions, which is what counselors do; they are only guides. I appreciated how Mead broached this topic. And honestly, after finishing this series, all of the readers will need professional help in dealing with their emotions. Richelle Mead is just showing what it's going to be like for her readers in the future. 2. Religion is shown as a comfort. From the beginning of the first novel, the reader knows that Rose has a rocky relationship with God and religion. She considers herself as an agnostic, relying on herself to thwart the darkness, but she also pulls comfort and strength at times of great turmoil. Not that I advise using religion as a Get-Out-of-Jail-Free Card, but this adds a dimension to her character that many teens experience today, and for that I like it. Though Rose is an agnostic as well as Dimitri, both of them still find solace in the church. They ask questions, though it’s not really out of religious reverence (it’s more or less how to find out what’s going on in their own lives). Even so, religion is still valid to their choices, and it is quite important to them. I also like that Mead provided a variety of beliefs. Lissa has extremely strong ties with the Russian Orthodox Church, and she believes quite strongly. On the other hand, you have Christian Ozera, who, if I am not misled, is quite the atheist. You have all manners of belief, yet they are all friends. 3. Politics become unsteady and a revolution is on its way. You can smell the scent of revolution in the air. It’s made of dust, blood, and sweat, and comes in the form of Moroi and Dhampir. After the attack against students of St. Vlad's (Christian, Eddie, Mason, Rose, and Mia), some Moroi have a desire to fight, others don’t have the same constitution and hide behind their Dhampir guardians. But what happens when the Guardians see that the only reason for their existence is to protect Moroi? This is the book that questions are posed and uneasiness flitters through the minds of students. And this is only the tip of the ice berg. I love that Mead wrote this in. I love a good revolution. Though this book does not contain revolutionary actions yet, questions are asked, and the students (especially Rose) consider them for the first time. Growing up as a student, they have been told what to think and how to act their entire lives, but what happens if all of that is brought into question? This is when growing up, becoming an adult, and making your own decisions can cost you your happiness or your life, and sometimes both. 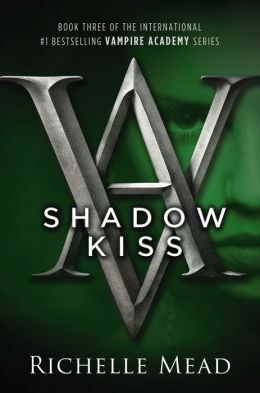 After having finished all of the books before writing this review, I can say that this is probably my most favorite book of the series. It hints at a lot of things to come, while also just being plain epic in action, dialogue, and character development. I gave this book 5 stars on my Goodreads.